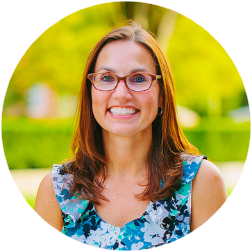 Mandy is a Registered and Licensed Dietitian Nutritionist and is a Certified Lactation Counselor through The Academy of Lactation Policy and Practice. She has experience in providing medical nutrition therapy to adults with diabetes and other lifestyle-related diseases but has a real love of working with kids and new moms. She has presented on a wide variety of nutrition topics and held cooking demonstrations locally and nationally. Before becoming a dietitian, she had the pleasure of feeding the circus elephants, making Maryland’s largest salad, selling bread at the height of the Atkins Diet craze, and developing a cookbook for one of the nation’s top-selling pretzel companies.